These are the adult wher adoptables who have been born onsite! The group names are what wherling group they were from! Please keep the profiles intact! They must still come from the original clutch and have gone through wherlinghood at their birth location but they can move around once they graduate. FULL APPEARANCE: On the larger end for blues, but not awkward, -sk cannot be mistaken for anything other than a blue. He is a bold, incredibly bright blue all over, like a shining gem or the ocean at just the right time of day. There are dark, navy-blue markings around his eyes, like he's some sort of burglar or maybe a raccoon. It is his wings where things shine. 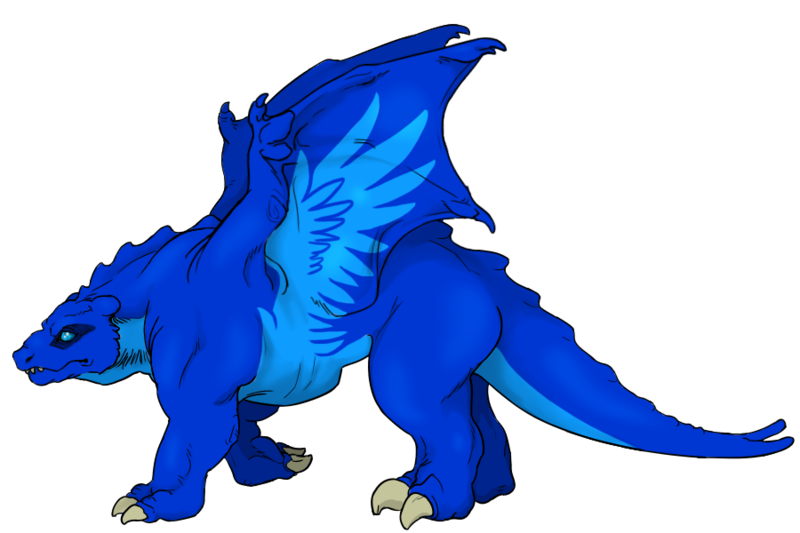 His underside is a bright, cerulean blue, with markings surging up his sides and under his wingsails as if he has giant, feather wings. The faux-wings are enough that he could probably be mistaken for a wher with feathers, but it only takes the right touch to know otherwise. He won't be flying, but the effect is good enough. PERSONALITY: -sk is a wher full of love and joy, a precious squish who wants nothing more in life to make other people happy. He is one of the most cheerful and patient whers one might ever meet, particularly good with children and those who are shy. 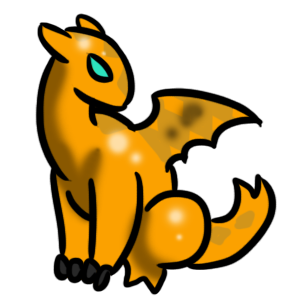 He loves making new friends and is an incredibly trusting creature; forgiveness is second nature to him, and he will go to the ends of the earth to make sure his friends are cared for and content. Nothing drives him more than feeling like he can help someone. -sk is particularly gentle, not enjoying violence beyond the necessities of life, such as eating. He does not see a point to it - why fight, when you could talk and work things out? He's easily one of the most kind souls in the Weyr, going out of his way to spend extra time caring for his handler or their friends and learning how to do helpful things (such as assist with tilling or carrying children around for a ride). Somewhat of a home body, he loves to be around his friends and focuses on making others smile to the best of his ability. Voice: -sk has a childlike voice, full of wonder and curiosity all the time. FULL APPEARANCE: -sk is a beautiful wher. A lovely, silvery-green color, fading into darker green on her haunches and tail, -sk looks like she is standing in shadow, emerging into the light. The impression is perhaps only emphasized by the way she moves; -sk tends to always turn to face whoever is in the room, either through attentiveness or vigilance. The trailing edge of her wings are colored with little loops of bright seafoam green, edges, with the darker color of her tailtips, and standing out vividly against her hide. Her face is similarly vivid, with dark teal marking her throat and snaking up in ribbons, and a pale, near-white mask in a vee across the front of her face. PERSONALITY: What a witchy, twitchy thing! -sk is similar to her green brother, excepting that where he is a social big talker, she is a quiet but pushy little thing. She's small but bold when given time to warm up, the type to lead up little gangs of whers to push around and play with. She likes to have minions, and will try to gather people to her side at any given chance, even though she socially a little awkward. She isn't afraid to get what she wants, but she doesn't think on a big scale; her schemes are always playful and low-key. She'll never have the urges to get into big troubles or chase big problems; its simply too much for her, though she'll follow as directed. With her handler, she'll be an excellent assistant. She is more playful than dangerous, but she has a strong sense of wanting to please him and keep him happy. She doesn't know much in the way of thinking like Evander ever did; paranoia is just something she doesn't quite grasp. But she knows fear and disappointment, and she doesn't want to disappoint him. Despite this, she has a child-like demeanor at her core and she just wants to have fun. All in all, she's an excellent cohort to follow her chosen wherever they may lead. VOICE: She has a whimsical and high-pitched voice that has some singsongy qualities to it. FULL APPEARANCE: Even among his siblings, --sk is a standout. 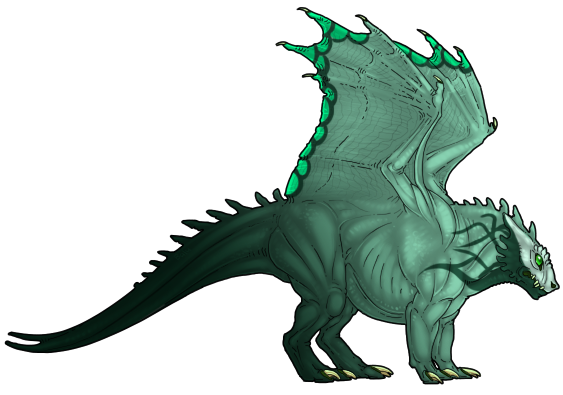 His base color is a deep teal in an almost uniform shade across his entire body, and unlike the average blue, his hide has a satiny sheen. Even more unusual, however, are --sk's markings. 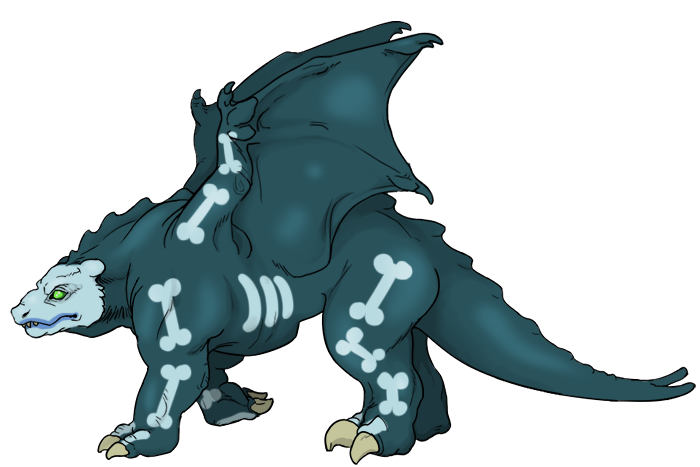 In a pale blue color, cartoonish "bones" lie over the areas where all his major bones are - a skull marking, "bones" across the long bones of his legs and wings, and three "ribs" lying over his actual ribs. Though the bone markings are not remotely in the actual shape of his real bones, they do lie in the right places, making it surprisingly easy to watch what his bones are doing under his skin. It can be a little mesmerizing to watch, even, particularly given the smooth way that he moves across the ground, never stumbling, and with an uncanny ability to put his feet just right, no matter how rough the ground. PERSONALITY: --sk is a wannabe troublemaker who lusts for adventure and knowing what is out in the world. He is not a natural born leader, but instead happily follows along with his cohorts. That said, he does not lack in bold personality; no, he is still quite loud! --sk is also extremely opinionated, wanting to make sure that his voice is heard and acknowledged as much as anyone else in his group is. He hates to feel left out or forgotten, as is common with younger children; to him, to be seen and acknowledged makes him feel welcome and wanted. He wants to know he is part of something greater but seen for who he is, and loved as an individual. He has many ideas and will want to share them all, and the call of what's out in the world is a big part of who he is. He'll want to explore, he'll want to know whatever there is to know, and he'll demand that he contribute. But at his core, he just wants to be loved and accepted as one of the pack. To his fellow whers, he is energetic but friendly, often turning things into exciteable competitions. To his handler, he is devoted. He may bicker with them - after all, sometimes he DOES know best! - but he'll equally listen and work with them, provided they are accepting of his rambunctious and playful nature. Voice: He sounds like an adventurous little boy! -sk is not the largest white, and probably will not be one of the largest whers around. She is, however, very dainty. She doesn't actively like getting dirty, but won't shy away from mud and dirt if there's work to do. She's a bit scraggly, and will have to grow into her limbs and muscles. She'll be a fast wher, but stamina will be an issue. She is mostly a bright white all over, except for the dark gray ghostly markings around her eyes, nose, and mouth. 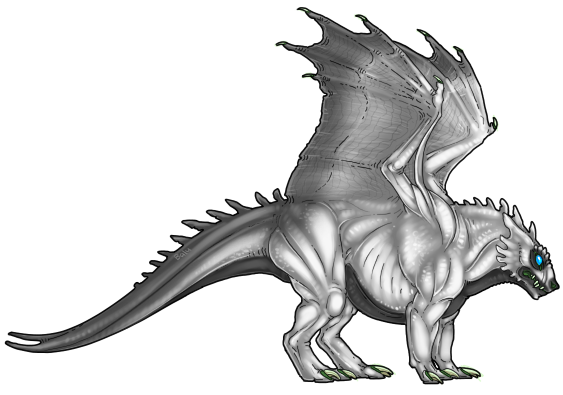 Her underbelly is the same dark color, and her wingsails and back of her hips and tail are a lighter, more smokey gray. There are quiet, dainty whers. -sk is capable of being dainty... when she feels like it. She's not a rowdy tomboy, but she's really not graceful and she's not always proud of it. It's easy to embarrass her, and there's an equal chance of her suddenly turning shy or reacting by introducing someone's kneecaps to her skull. Or jaws. Headbutting is preferred for her, however. She does find ways to enjoy herself though, and has quite the fondness for music and stories. One day, she'll probably learn how to tell them herself, in her own, choppy-speech-way. Her handler, who will almost always be called 'Doll' except in very specific circumstances, is special to -sk. She wants him to be maybe a little less afraid of ladyfolk, though Ellaren utterly terrifies her. Still, she's very willing to work, and isn't an awkward sort among new people, unless she someone embarrasses her of course. She knows she'll get better, and she knows she can help him get better. She also enjoys a good joke, and likes to sit around in low light, just giving toothy grins to anyone passing by with her ghost-like-face. Voice: -sk's voice is not unlike her ghostly appearance. She's chipper, but it usually sounds like she is constantly whispering excitedly. -sk is a pretty average-sized bronze. He's a little pudgy, but solidly built with a round face and an admittedly sweet expression. He looks pretty unassuming, and he's not light on his feet. He tries very hard to not stomp around, but he's honestly not a light stepper. He claims his shine is blinding. He's pretty washed out for a bronze, with his face covered in more typical bronze-olive colored-shapes, looking like an odd sort of mask. The same color trails around his back end and sides, crossing under his belly. His back end and back legs are colored with a lighter, more olive-oil colored bronze. Silly it may be, he does lick things to try claiming things for his own. -sk is a rather optimistic wher, almost to the point of silliness. He can find the best parts of almost anything. He loves puzzles, loves riddles, and loves solving them. There's a childish sort of fun to him. That doesn't mean he's dumb, or oblivious. He's very loyal, and when he sets his mind to a task, he will do his best to get it done. He isn't very good at multi-tasking, and only really focuses on one thing at a time. He is very good at keeping secrets. It might take him a few times meeting someone to remember their face. He is very bad at facial recognition, but he means well. With his handler, he thinks that he should do the best he can to help the man. He may not outright understand his loyalty to Evander, but he knows that loyalty is something he should strive for. And to his credit, -sk is very loyal. He wants to be a good partner. He wants to do his best to help, even if he makes mistakes. He wants to learn from -sk, to try to be a better sort of wher. He tries, and he likes to try. Voice: -sk has a light voice, and he doesn't like to shout. He has an even voice, if a bit of an androgynous one. FULL APPEARANCE: -sk is about average for a brown, and it doesn't bother him. He has a long stride, and is very bad at walking quietly. He's rather wide, a mix of pudge and muscle, and he manages to be a very round ball when he's tired and wants to just be a lump and not moving. 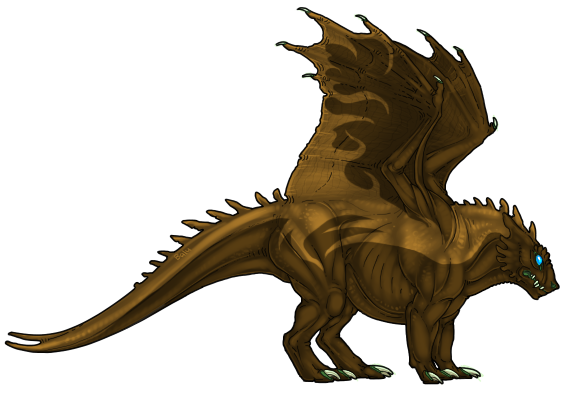 He's a very warm brown, a wooden sort of brown, with lighter coloration - like a good brandy. The lighter color goes down his back, curling along his sides and the undersides of his wings like feathers bleeding into flames. He is very steady on his feet, but not very flexible. PERSONALITY: -sk is a very loyal wher. He decides on who is his little family, and they are thus his family for life. Evander was his human, and he was stuck with the man- but no more. His handler is also his human, and he adores them. Even though he's still young, he acts like a caring father figure. He's stern when he needs to be, but he's mostly friendly and rather caring. He doesn't like to raise his voice. 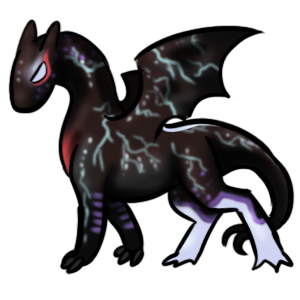 He has almost no fear, and will charge headlong into the dark or into a dangerous situation if there is someone to rescue. He might start adopting other humans, or their whers, or flits. He enjoys taking care of others. To his handler, while he is aware his connection to them is lacking, he is aware that they could probably use someone else to keep an eye on them. He's a wher of simple pleasures, wanting to protect and care for his new (little) family. He and his bronze brother frequently are on the same wavelength, and they are very close friends. He wants to learn from the others in his pack and help them grow in turn. VOICE: -sk has a fairly masculine voice, though he frequently ends his thoughts with an upward inflection, as if he's constantly asking questions. NOTE: -sk was originally blood bound to Evander, Fort's ex-lord holder. His handler was one of Evander's elite guards. Vaesk is... not a large brown. He's short, he's small, he's rather narrow and a little gangly. He's almost runty, and he sort of looks like an overgrown foal, if it weren't for the extremely obvious fact that he's a wher. He's got a strong gait, even if he doesn't look like he'd be good for any sort of running or physical activity. He's actually got a lot of endurance, and though his pain tolerance is a little low, he pushes himself to take on any sort of burden, even if it's not his own. He is a pale, washed-out brown, almost albino. Across his hide are slightly darker, more coppery-brown markings like dry river beds, or a map. He wouldn't call them cracks, however, more like different paint strokes. -sk is... an introvert. He doesn't like to go out, he doesn't like to cause trouble. However, he is extremely altruistic. He will drop everything he is doing to help old ladies across the street, or help almost anyone. He is a pretty good judge of people, and while he may not talk a lot, or say a lot, he will raise his voice if he thinks his handler is doing something wrong. Even though they may differ on what is 'right', he trusts his handler and his judgment. 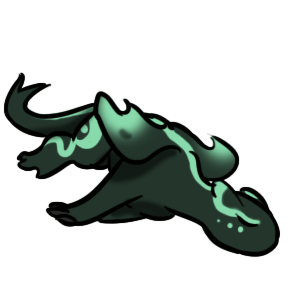 His handler, however, will have to deal with -sk's awkward and sweet little squish on his brother, and the two whers work wonderfully together. -sk is also very skeptical, and cautious. He doesn't believe in ghost stories and legends, and he prefers to look before he leaps. With Varys, he will probably try to sneak in little words here and there about what he thinks they should do. He wants to learn how to make things right, and has a fair sense that something is wrong with the world right now, and something has to change. Voice: -sk has a somewhat quiet voice. He doesn't like to shout. He is, however, prone to saying "What the forsk?" or "What in the shell?" when he's confused.